Protesters plan to build a "fortress" occupied by "ordinary people" on land earmarked for the construction of Heathrow's third runway. Last year a Greenpeace coalition bought an acre of land near Sipson village and gave ownership to 60,000 people. It has invited architects to submit designs for a "fortress" to resist bulldozers, if the runway goes ahead. The government-backed runway is due to be built in 2015. Conservatives and Lib Dems are fighting the £7bn plans. The coalition gave ownership of the land to 60,000 people in a bid to create legal obstacles to delay or stop the runway scheme. It launched a competition to design the "impenetrable fortress", to be built as soon as possible unless the airport expansion is abandoned. 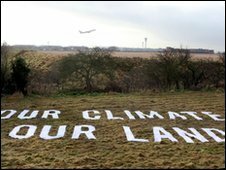 Greenpeace executive director John Sauven said: "Whoever wins the next election, they will come under enormous pressure from the all-powerful aviation industry to push ahead with a third runway. "But if the bulldozers roll they will face a fortress occupied by a massive movement of ordinary people who oppose Heathrow expansion." Greenpeace also asked members of the public for ideas how to protect the land, which it bought with groups including the Woodland Trust, the RSPB and World Development Movement. The best fortress design will be chosen by a panel including sculptor Rachel Whiteread, engineer Professor Neil Thomas and comedian Alistair McGowan. The former transport secretary Geoff Hoon said last January a new Heathrow runway would create up to 60,000 jobs and would ensure "Britain remains a place where the world can come to do business". But environmental groups, councils, residents and the RSPB said the expansion would damage wildlife and increase pollution and congestion. A Department for Transport spokesman said: "We stand by the decision we made on Heathrow's expansion in January last year." In November last year actors, politicians and Poet Laureate Carol Ann Duffy planted an orchard on the Greenpeace coalition site.